This journal supplement is intended for dermatologists, nurse practitioners, nurses, physician assistants, and other clinicians who treat acne and rosacea. Participants should read the activity information, review the activity in its entirety, and complete the online post-test and evaluation. Upon completing this activity as designed and achieving a passing score on the post-test, you will be directed to a Web page that will allow you to receive your certificate of credit via e-mail or you may print it out at that time. The online post-test and evaluation can be accessed at http://tinyurl.com/acnerosaceasupp2018. Inquiries about CME accreditation may be directed to the University of Louisville Office of Continuing Medical Education & Professional Development (CME & PD) at cmepd@louisville.edu or (502) 852-5329. This activity has been planned and implemented in accordance with the accreditation requirements and policies of the Accreditation Council for Continuing Medical Education (ACCME) through the joint providership of the University of Louisville Global Academy for Medical Education, LLC. The University of Louisville is accredited by the ACCME to provide continuing education for physicians. The University of Louisville Office of Continuing Medical Education & Professional Development designates this live activity for a maximum of 2.0 AMA PRA Category 1 CreditsTM. Physicians should only claim credit commensurate with the extent of their participation in the activity. Designated for 0.6 contact hours of pharmacotherapy credit for Advance Practice Registered Nurses. Acne and rosacea are common skin conditions that, if inadequately treated, can significantly affect an individual’s quality of life. Clinicians need tostay current on recent scientific research that is revealing the underlying pathophysiology of these conditions, because such knowledge can support the choice of appropriate therapy to improve outcomes. Inflammation is now known to be a primary factor in acne and may persist throughout the lesion life cycle, even beyond the disappearance of visible lesions. Proliferation of Propionibacterium acnes bacteria contributes to the inflammatory process; the cytokines activated by P acnes infection have been identified as targets for acne therapy, including the use of new and emerging topical and systemic agents. Clinicians should be familiar with new data on traditional, novel, and emerging therapies for rosacea, their mechanisms of action, and their efficacy and safety as monotherapy and in combination. Clinicians should also be familiar with acne treatment strategies targeted for special populations, including adult women (especially those who are or want to become pregnant) and in individuals with skin of color. Andrew F. Alexis, MD, MPH, Consultant: Allergan plc, BioPharmX, Inc., Galderma Laboratories, L.P. Contracted Research: Allergan plc, BioPharmX, Inc., Galderma Laboratories, L.P., Novan, Inc.
Julie C. Harper, MD, Consultant: Allergan plc, Bayer AG, BioPharmX, Inc., Galderma Laboratories, L.P., La Roche-Posay, Novan, Inc., Ortho Dermatologics. Contracted Research: Bayer AG. Speakers Bureau: Allergan plc, Bayer AG, La Roche-Posay, Ortho Dermatologics. Linda F. Stein Gold, MD, Consultant: Allergan plc, Dermira, Inc., Foamix Pharmaceuticals Ltd., Galderma Laboratories, L.P., Medimetriks Pharmaceuticals, Inc., Novan, Inc., Valeant Pharmaceuticals International, Inc. Contracted Research: Allergan plc, Dermira, Inc., Foamix Pharmaceuticals Ltd., Galderma Laboratories, L.P., Novan, Inc., Valeant Pharmaceuticals International, Inc. Speakers Bureau: Allergan plc, Galderma Laboratories, L.P., Valeant Pharmaceuticals International, Inc.
Jerry K. L. Tan, MD, FRCPC, Consultant: Allergan plc, Galderma Laboratories, L.P., Valeant Pharmaceuticals International, Inc. Contracted Research: Dermira, Inc., Galderma Laboratories, L.P., Valeant Pharmaceuticals International, Inc. Speakers Bureau: Galderma Laboratories, L.P., Valeant Pharmaceuticals International, Inc.
University of Louisville CME & PD Advisory Board and Staff Disclosures: The CME & PD Advisory Board and Staff have nothing to disclose. CME/CE Reviewers: Cindy E. Owen, MD, Clinical Assistant Professor, Division of Dermatology, Department of Medicine, University of Louisville School of Medicine, has nothing to disclose. The Postgraduate Institute of Medicine planners and managers have nothing to disclose. Global Academy for Medical Education Staff: Eileen A. McCaffrey, MA; Tristan M. Nelsen, MNM, CMP, HMCC; Sylvia H. Reitman, MBA, DipEd; and Ron Schaumburg have nothing to disclose. This CME/CE activity discusses the off-label use of certain approved medications as well as data from clinical trials on investigational agents. Any such material is identified within the text of the articles. Copyright © 2018 by Global Academy for Medical Education, LLC, Frontline Medical Communications Inc., and its Licensors. All rights reserved. No part of this publication may be reproduced or transmitted in any form, by any means, without prior written permission of the Publisher. Global Academy for Medical Education, LLC, Global Education Group, and Frontline Medical Communications will not assume responsibility for damages, loss, or claims of any kind arising from or related to the information contained in this publication, including any claims related to the products, drugs, or services mentioned herein. Isard O, Knol AC, Ariès MF, et al. Propionibacterium acnes activates the IGF-1/IGF-1R system in the epidermis and induces keratinocyte proliferation. J Invest Dermatol. 2011;131:59-66. Melnik BC. p53: Key conductor of all anti-acne therapies. J Transl Med. 2017;15:195. Dreno B, Gollnick HP, Kang S, et al; Global Alliance to Improve Outcomes in Acne. 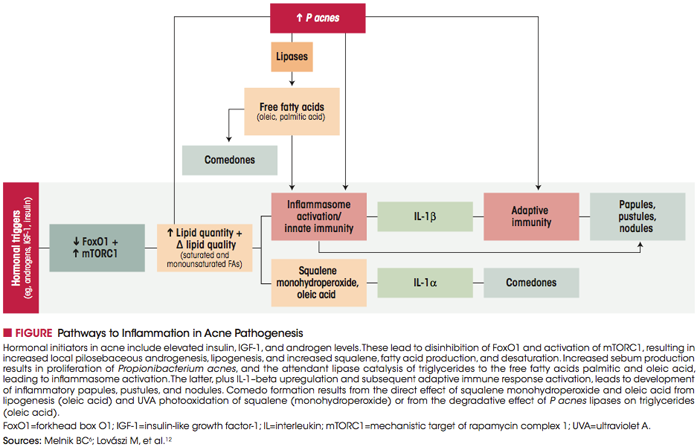 Understanding innate immunity and inflammation in acne: Implications for management. J Eur Acad Dermatol Venereol. 2015;29(suppl 4):3-11. Jeremy AH, Holland DB, Roberts SG, Thomson KF, Cunliffe WJ. Inflammatory events are involved in acne lesion initiation. J Invest Dermatol. 2003;121:20-27. Ben-Amitai D, Laron Z. Effect of insulin-like growth factor-1 deficiency or administration on the occurrence of acne. J Eur Acad Dermatol Venereol. 2011;25:950-954. Melnik BC. Linking diet to acne metabolomics, inflammation, and comedogenesis: An update. Clin Cosmet Investig Dermatol. 2015;8:371-388. Chiba K, Yoshizawa K, Makino I, Kawakami K, Onoue M. Comedogenicity of squalene monohydroperoxide in the skin after topical application. J Toxicol Sci. 2000;25:77-83. Gribbon EM, Cunliffe WJ, Holland KT. Interaction of Propionibacterium acnes with skin lipids in vitro. J Gen Microbiol. 1993;139:1745-1751. Katsuta Y, Iida T, Hasegawa K, Inomata S, Denda M. Function of oleic acid on epidermal barrier and calcium influx into keratinocytes is associated with N-methyl d-aspartate-type glutamate receptors. Br J Dermatol. 2009;160:69-74. Katsuta Y, Iida T, Inomata S, Denda M. Unsaturated fatty acids induce calcium influx into keratinocytes and cause abnormal differentiation of epidermis. J Invest Dermatol. 2005;124:1008-1013. Choi EH, Ahn SK, Lee SH. The changes of stratum corneum interstices and calcium distribution of follicular epithelium of experimentally induced comedones (EIC) by oleic acid. Exp Dermatol. 1997;6:29-35. Lovászi M, Szegedi A, Zouboulis CC, Töro ̋csik D. Sebaceous-immunobiology is orchestrated by sebum lipids. Dermatoendocrinol. 2017:9:e1375636. Thiboutot DM. Inflammasome activation by Propionibacterium acnes: The story of IL-1 in acne continues to unfold. J Invest Dermatol. 2014;134:595-597. Kim J, Ochoa MT, Krutzik SR, et al. Activation of toll-like receptor 2 in acne triggers inflammatory cytokine responses. J Immunol. 2002;169:1535-1541. Qin M, Pirouz A, Kim MH, Krutzik SR, Garban HJ, Kim J. Propionibacterium acnes induces IL-1ß secretion via the NLRP3 inflammasome in human monocytes. J Invest Dermatol. 2014;134:381-388. Kistowska M, Gehrke S, Jankovic D, et al. IL-1ß drives inflammatory responses to Propionibacterium acnes in vitro and in vivo. J Invest Dermatol. 2014;134:677-685. Dinarello CA. Interleukin-1 in the pathogenesis and treatment of inflammatory diseases. Blood. 2011;117:3720-3732. Jalian HR, Liu PT, Kanchanapoomi M, Phan JN, Legaspi AJ, Kim J. All-trans retinoic acid shifts Propionibacterium acnes-induced matrix degradation expression profile toward matrix preservation in human monocytes. J Invest Dermatol. 2008;128:2777-2782. Sato T, Kurihara H, Akimoto N, Noguchi N, Sasatsu M, Ito A. Augmentation of gene expression and production of promatrix metalloproteinase 2 by Propionibacterium acnes- derived factors in hamster sebocytes and dermal fibroblasts: A possible mechanism for acne scarring. Biol Pharm Bull. 2011;34:295-299. Kistowska M, Meier B, Proust T, et al. Propionibacterium acnes promotes Th17 and Th17/ Th1 responses in acne patients. J Invest Dermatol. 2015;135:110-118. Fitz-Gibbon S, Tomida S, Chiu BH, et al. Propionibacterium acnes strain populations in the human skin microbiome associated with acne. J Invest Dermatol. 2013;133:2152-2160. Iyer SS, Cheng G. Role of interleukin 10 transcriptional regulation in inflammation and autoimmune disease. Crit Rev Immunol. 2012;32:23-63. Yu Y, Champer J, Agak GW, Kao S, Modlin RL, Kim J. Different Propionibacterium acnes phylotypes induce distinct immune responses and express unique surface and secreted proteomes. J Invest Dermatol. 2016;136:2221-2228. Janiczek-Dolphin N, Cook J, Thiboutot D, Harness J, Clucas A. Can sebum reduction predict acne outcome? Br J Dermatol. 2010;163:683-688. Munday MR. Regulation of mammalian acetyl-CoA carboxylase. Biochem Soc Trans. 2002;30:1059-1064. Melnik BC. Olumacostat glasaretil, a promising topical sebum-suppressing agent that affects all major pathogenic factors of acne vulgaris. J Invest Dermatol. 2017;137:1405-1408. Qin M, Landriscina A, Rosen JM, et al. Nitric oxide-releasing nanoparticles prevent Propionibacterium acnes-induced inflammation by both clearing the organism and inhibiting microbial stimulation of the innate immune response. J Invest Dermatol. 2015;135:2723-2731. Baldwin H, Blanco D, McKeever C, et al. Results of a phase 2 efficacy and safety study with SB204, an investigational topical nitric oxide-releasing drug for the treatment of acne vulgaris. J Clin Aesthet Dermatol. 2016;9:12-18. Rocha MAD, Guadanhim LRS, Sanudo A, Bagatin E. Modulation of toll like receptor-2 on sebaceous gland by the treatment of adult female acne. Dermatoendocrinol. 2017;9:e1361570. Jones DA. The potential immunomodulatory effects of topical retinoids. Dermatol Online J. 2005;11:3. Dispenza MC, Wolpert EB, Gilliland KL, et al. Systemic isotretinoin therapy normalizes exaggerated TLR-2-mediated innate immune responses in acne patients. J Invest Dermatol. 2012;132:2198-2205. Gregoriou S, Kritsotaki E, Katoulis A, Rigopoulos D. Use of tazarotene foam for the treatment of acne vulgaris. Clin Cosmet Investig Dermatol. 2014;7:165-170. Tenaud I, Khammari A, Dreno B. In vitro modulation of TLR-2, CD1d and IL-10 by adapalene on normal human skin and acne inflammatory lesions. Exp Dermatol. 2007;16:500-506. Zuliani T, Khammari A, Chaussy H, Knol AC, Dréno B. Ex vivo demonstration of a synergistic effect of adapalene and benzoyl peroxide on inflammatory acne lesions. Exp Dermatol. 2011;20:850-853. Jones DA. Rosacea, reactive oxygen species, and azelaic acid. J Clin Aesthet Dermatol. 2009;2:26-30. Publication of this CME/CE article was jointly provided by University of Louisville, Postgraduate Institute for Medicine, and Global Academy for Medical Education, LLC, and is supported by an educational grant from Bayer. The authors have received an honorarium for their participation in this activity. They acknowledge the editorial assistance of Eileen A. McCaffrey, MA, medical writer, and Global Academy for Medical Education in the development of this continuing medical education journal article.